A spice you’ll see pop up time and time again in Spanish cuisine is Smoked Paprika. The best paprika in the world is grown and produced in La Vera, a small region in Spain where the fertile soils and mild climate produce the perfect atmosphere for the little red peppers used to make Pimentón (Smoked Paprika). The peppers are harvested and dried over smoked oakwood to achieve the ideal Pimentón de la Vera flavor. They are then milled by stone wheels slowly which turns it into the bright red powder you’ll see on your grocery shelves. Though Spaniards and other chefs would make the argument it’s not real smoked Paprika unless it’s produced in La Vera, I bought mine at my local grocery store. I don’t believe “perfect” ingredients should stand between us and cooking Spanish foods at home. That said, this is a special occasion type of dish. Tuna isn’t exactly cheap, which is why we’re using a small amount and serving it up as a side dish. 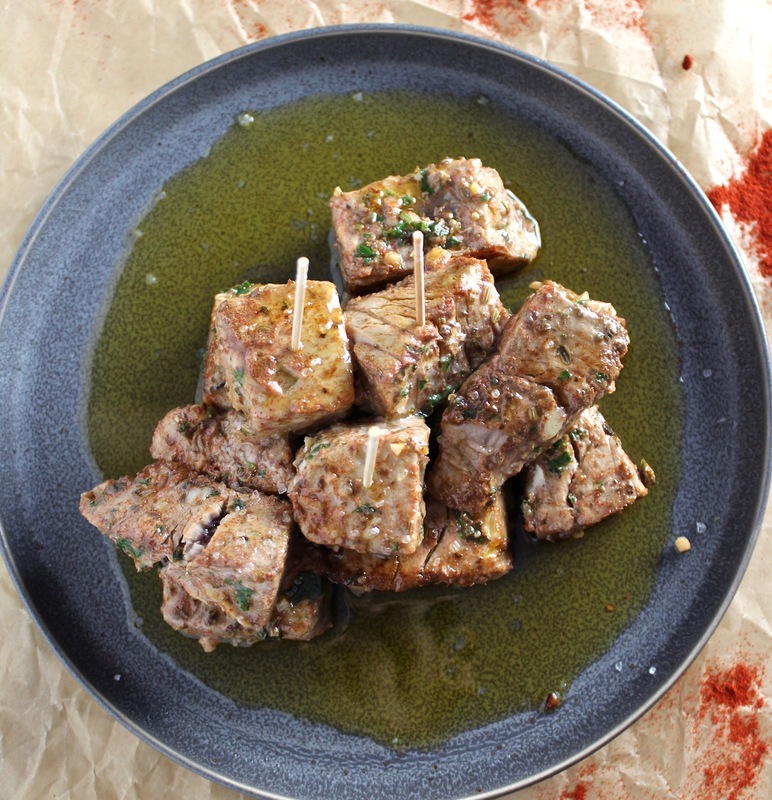 Tuna with Smoked Paprika is actually very easy to prepare, and takes about 15 minutes of active prep/cook time. 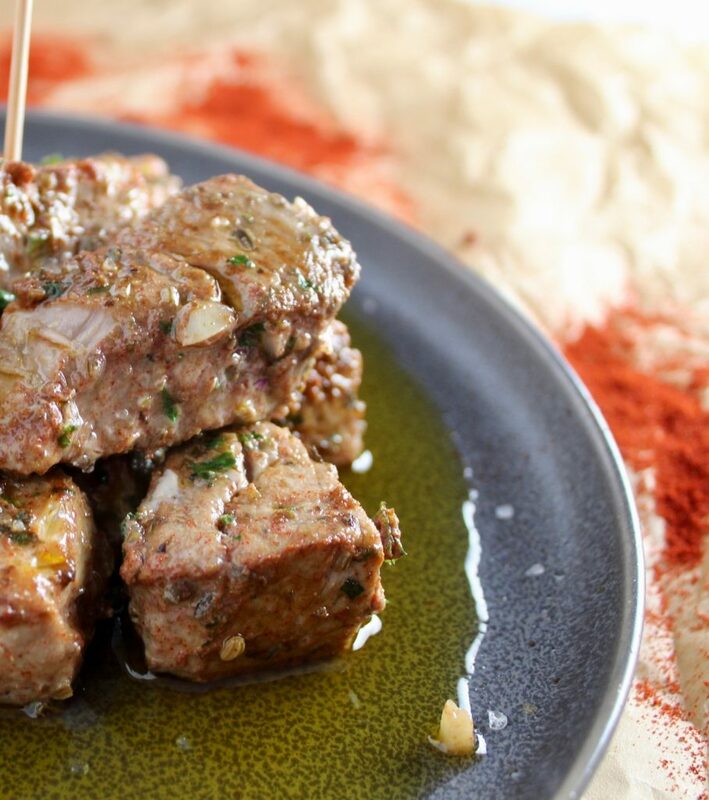 Everything else is just letting the tuna marinate in our spices. I served this along side some crusty bread, and sautéed dandelion greens. The sauce you get on the bottom of the pan is liquid gold and should be poured on top of the tuna as soon as it’s pulled off the heat. The resulting pool of sauce on the bottom of your plate is why you need crusty bread for this dish. This is a great dish if you’re having guests over and want a small taste of something special to go along side a rice or pasta dish. You could also half the recipe and prepare yourself a nice little dinner for you and a friend this weekend. I adapted this recipe slightly from Rustica: A Return to Spanish Home Cooking. 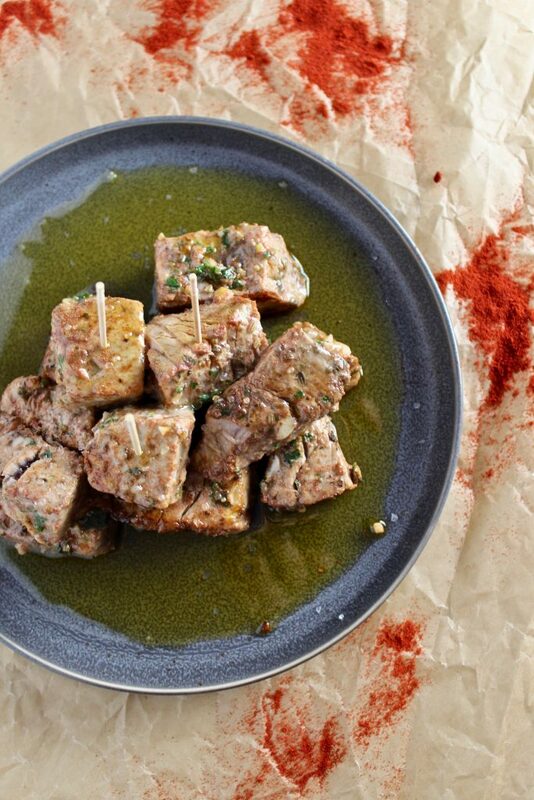 The night before you want to make Tuna with Smoked Paprika, you’ll let the tuna marinate. Cut the tuna into 1 inch chunks and place in a medium sized bowl. Add your smoked paprika, fennel seeds, oregano, garlic, parsley and 1/3 cup white wine. Cover with plastic wrap and let sit over night. When you’re ready to make the tuna, heat the olive oil in a pan over the stove on medium high heat. Add the tuna to the pan for 2 minutes, so you get a sear on one side. Season with salt. Then add 2 Tbsp of white wine to the pan to get the browned bits moving, and flip to the other side for another minute. You want the tuna seared on the outside, but a little raw on the inside. 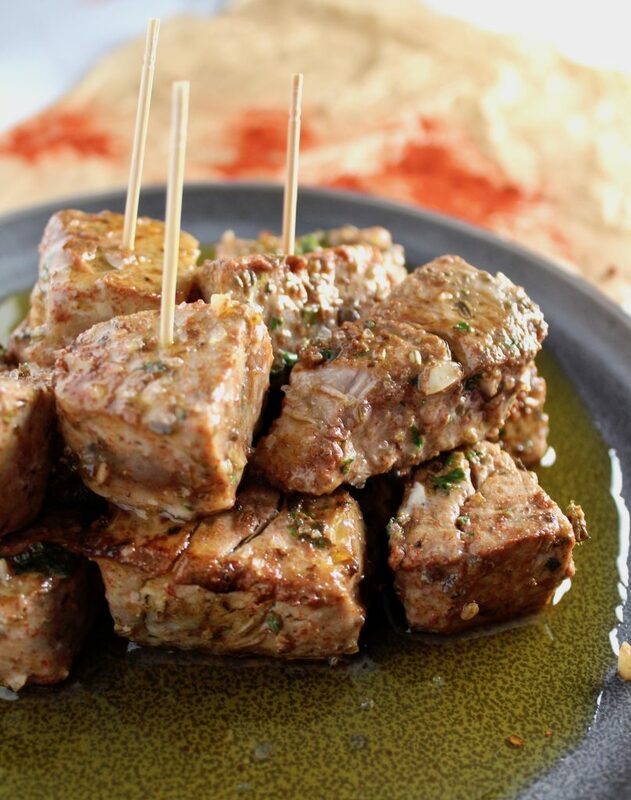 Place tuna on a plate and drizzle with any remaining oil/wine from the pan. Let rest for 5-10 minutes before serving.